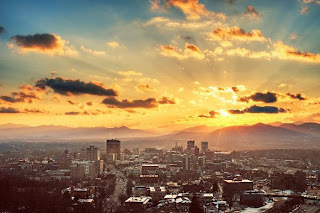 I referred a while back to a time in my younger days, when I lived in Asheville... Well, it was a beautiful time in a beautiful place. Nothing less than marrying my own true love could have torn me away from such a life. First of all, I had a great roommate - my best friend in the world, secondly, it has romantic significance for me because it was where Tom and I courted, and third... well, it was Asheville! Asheville has a rich history, and abundant natural beauty. In a previous post, I characterized Savannah as a woman... If Asheville were a woman, she would have curves that don’t stop, wear expensive vintage clothing and sing a sweet, nostalgic song. Or psalm. Because it is hard for me to be there and not be reminded how great God is. I never got used to seeing the mountains everywhere I went. Native son Thomas Wolfe wanted to write stories in which the mountains themselves were a main character. I totally understand that. I mean, I would be at WalMart, for instance, and look up – and gasp... Every day I drove through Beaucatcher Tunnel and when the town appeared before me, my heart just sang. One day everything was all shimmery with a sparkly golden mist... and when I mentioned it to a co-worker, she said, “Oh that’s just the sun shining on the smog trapped between the mountains.” And every afternoon as I left my downtown office and walk west toward our parking lot, gazing longingly over the mountains and how the sun and clouds hovered over... More often that not, the hymn, How Great Thou Art would pop into my head, “O Lord my God, When I in awesome wonder / Consider all the world Thy Hand hath made, I see the stars, I hear the rolling thunder, Thy pow’r throughout the universe displayed... If you like a traditional sound, here’s Elvis’s version... but if you like to groove, try this one. Even though my roommate and I lived in a nondescript apartment complex – a place people usually lived in on the way to somewhere else – our location could not have pleased me more. If you came in on Highway 70, you’d drive through Oteen, where Thomas Wolfe once holed up in a cabin to write. Oteen is nothing to look at, but just knowing that made me happy. If you’d drive a little way past our home, you’d get to a sweet little area called Happy Valley... It’s really not an especially remarkable neighborhood, but even the ordinary seemed extra quaint to me. Maybe it was the way the houses – sometimes made of stone – were kind of tucked in to the rolling landscape... maybe it was the fact that some people kept horses in their back yards... maybe it was the occasional bear-rummaging-through-a-trash-can-rumor you’d hear... Asheville is full of ordinary neighborhoods that looked extraordinary to me. Like the little The Manor Inn apartments – a group of charming residences that are part of an old mountain resort dating back to the late 1800s. Of course, there are also neighborhoods that were populated by gorgeous mansions – like those on Merrimon Avenue, or the historic Montford district in all its Victorian splendor. 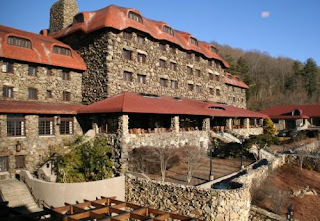 Also splendid – two major landmarks: the Biltmore Estate, and the Grove Park Inn. I love them both, but for some reason, I love most the earthy hobbit-hole-ishness of the Grove Park Inn. Made of stone, with walls of 6 feet thick and a fireplace so large you can stand in it... its view is spectacular, and I couldn’t even imagine having the dough to stay there. This stuff is all very expected when one speaks of Asheville. 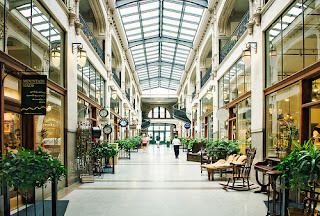 But there are so many things I love about it – the downtown architecture, for instance. If I understand correctly, the Great Depression hit especially hard in Asheville, so hard that very few new buildings were built in the downtown until maybe the 1970s... so the fantastic buildings – some built by craftsmen who had come to work on the Biltmore house – are still standing. 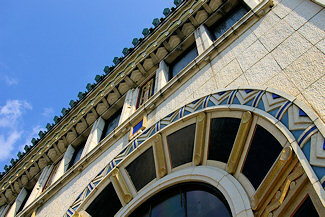 Ornate, gargoyle-adorned structures, spectacular Art Deco masterpieces... they’re all still there. Again with the Thomas Wolfe - but I found it fascinating to read his first-hand description of the real estate bubble that preceded the bust of the depression. Anyway, what follows is a list of additional things I love to look at and do when I go back to “the land of the sky” for a visit. I may not be telling you anything new, and I may be missing some best kept secrets, but I do love to make a list...! 1. 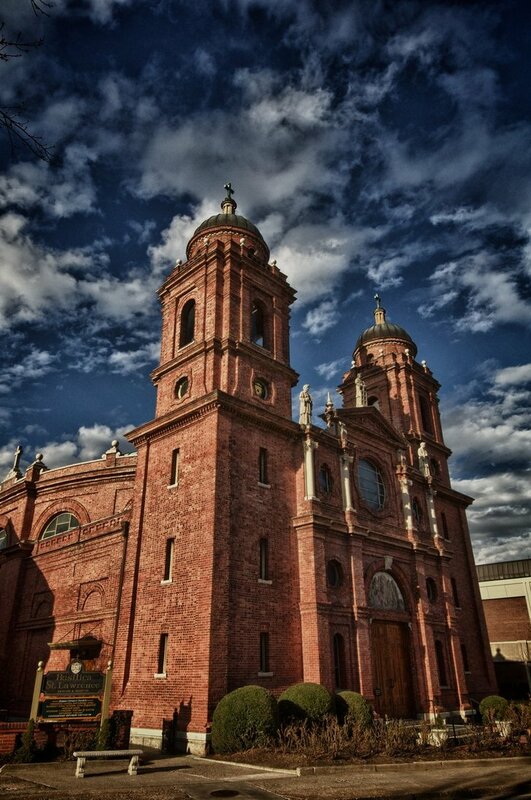 The Basilica of St. Lawrence: a gorgeous Catholic Church that was built by a Biltmore craftsman... full of great art and meditative silence. I certainly spent my share of time meditating in that silence. In fact, we took Bill to see it on our recent visit and even he – a slightly hyper seven-year-old boy, wanted to just sit and reflect a bit. 2. 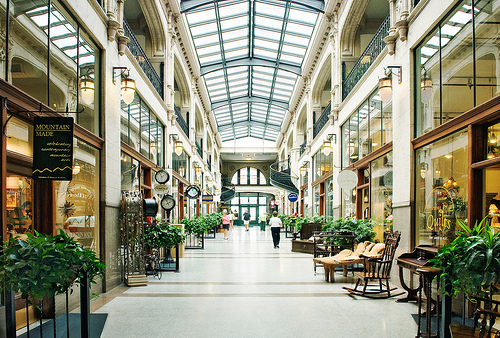 The Grove Arcade: an early version of a “shopping mall” that stood dormant for years, but was renovated, given a good polish and reopened for business for Asheville’s many tourists. 3. 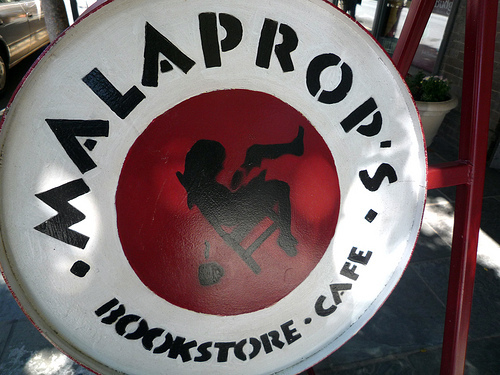 Malaprop’s Bookstore: The selection is not astonishing, but I am a sucker for an independent book seller... Also, Downtown Book & News on Lexington Avenue: A huge selection of used books and offbeat ‘zines. Really, Lexington Avenue is full of funky shops, and funny smellin’ kids that are fascinating to watch. Reminds me of the 80s when the occasional tourist would snap my photo outside Ruthless Records in Chapel Hill. 4. Speaking of Ruthless Records, Asheville still has plenty of independent record stores – like Karmasonics: Lots of tunes to thumb through just like in the old days. 5. 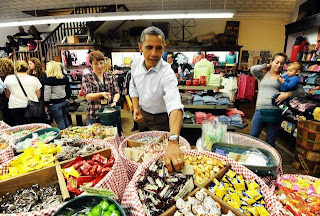 Mast General Store: Candy. 7. Early Girl Eatery. Locally grown, creative comfort food. 9. The Thomas Wolfe Memorial: When I moved to Asheville, my soon-to-be-husband gave me a copy of Look Homeward, Angel by Thomas Wolfe, which I devoured... After that, I read all his other books. I couldn’t get enough, really. Since they are biographical, I learned a great deal about Asheville’s history... I also learned that Thomas Wolfe and I both attended UNC and have worked at two of the same newspapers – The Durham Morning Herald, and the Asheville Citizen Times. 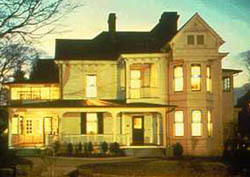 His mother ran a boarding house in Asheville, and you can go visit it! 10. TOPS for shoes: Every kind of shoes, comfy and courageous – functional and funky... and sometimes they have a buy one pair, get another for a penny sale! Don’t mind if I do! I guess 10 seems like a good round number for a list... I’m pretty sure there is nothing extraordinary about my list of must-sees, but it’s really stuff that I always really love and miss about the place. And now, a word from the psalmist: “I lift up my eyes to the mountains—where does my help come from? My help comes from the LORD, the Maker of heaven and earth." Mast General Store is definitely my first stop when I visit Asheville or the surrounding WNC areas!